MORDECAI ( ; probably = "belonging to Marduk," a Babylonian divinity). Chief minister of Ahasuerus and one of the principal personages of the Book of Esther. He was the son of Jair, a Benjamite, and a cousin of Esther, whom he adopted as his daughter. He had previously been carried into captivity together with Jeconiah by Nebuchadnezzar, King of Babylon (Esth. ii. 5-7, 15). Living at Shushan, the Persian capital, and sitting constantly at the gate of the king's palace, Mordecai discovers a plot of two eunuchs against the king. 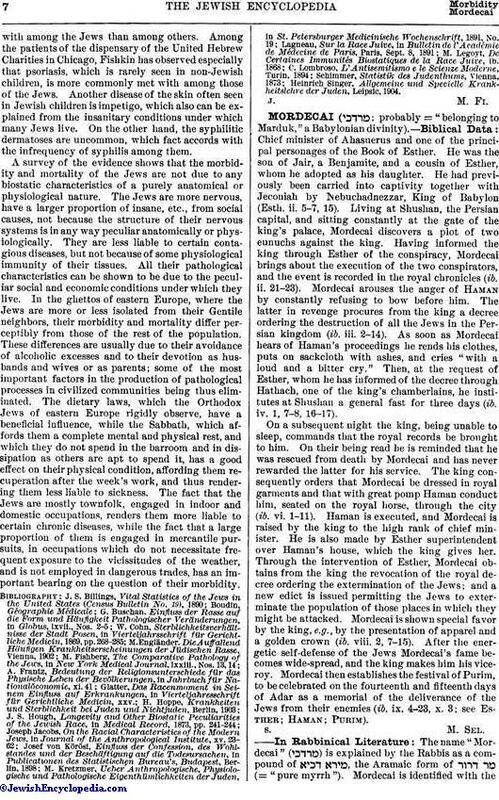 Having informed the king through Esther of the conspiracy, Mordecai brings about the execution of the two conspirators, and the event is recorded in the royal chronicles (ib. ii. 21-23). Mordecai arouses the anger of Haman by constantly refusing to bow before him. The latter in revenge procures from the king a decree ordering the destruction of all the Jews in the Persian kingdom (ib. iii. 2-14). As soon as Mordecai hears of Haman's proceedings he rends his clothes, puts on sackcloth with ashes, and cries "with a loud and a bitter cry." Then, at the request of Esther, whom he has informed of the decree through Hathach, one of the king's chamberlains, he institutes at Shushan a general fast for three days (ib. iv. 1, 7-8, 16-17). On a subsequent night the king, being unable to sleep, commands that the royal records be brought to him. 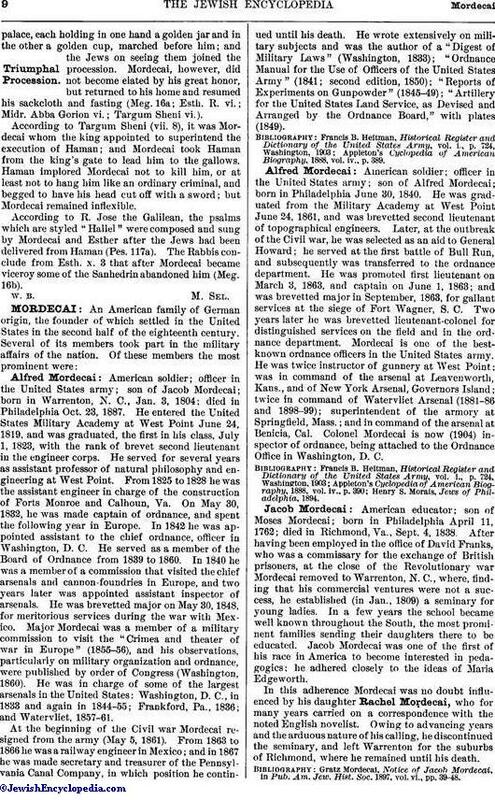 On their being read he is reminded that he was rescued from death by Mordecai and has never rewarded the latter for his service. The king consequently orders that Mordecai be dressed in royal garments and that with great pomp Haman conduct him, seated on the royal horse, through the city (ib. vi. 1-11). Haman is executed, and Mordecai is raised by the king to the high rank of chief minister. He is also made by Esther superintendent over Haman's house, which the king gives her. Through the intervention of Esther, Mordecai obtains from the king the revocation of the royal decree ordering the extermination of the Jews; and a new edict is issued permitting the Jews to exterminate the population of those places in which they might be attacked. Mordecai is shown special favor by the king, e.g., by the presentation of apparel and a golden crown (ib. viii. 2, 7-15). After the energetic self-defense of the Jews Mordecai's fame becomes wide-spread, and the king makes him his viceroy. Mordecai then establishes the festival of Purim, to be celebrated on the fourteenth and fifteenth days of Adar as a memorial of the deliverance of the Jews from their enemies (ib. ix. 4-23, x. 3; see Esther; Haman; Purim). The name "Mordecai" ( ) is explained by the Rabbis as a compound of , the Aramaic form of (= "pure myrrh"). Mordecai is identified with thebearer of that name who, according to Ezra ii. 2 and Neh. vii. 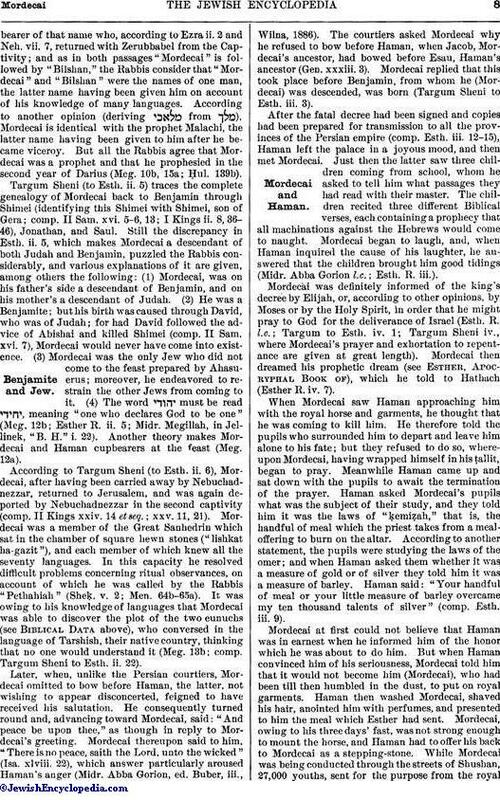 7, returned with Zerubbabel from the Captivity; and as in both passages "Mordecai" is followed by "Bilshan," the Rabbis consider that "Mordecai" and "Bilshan" were the names of one man, the latter name having been given him on account of his knowledge of many languages. According to another opinion (deriving from ). Mordecai is identical with the prophet Malachi, the latter name having been given to him after he became viceroy. But all the Rabbis agree that Mordecai was a prophet and that he prophesied in the second year of Darius (Meg. 10b, 15a; Ḥul. 139b). Targum Sheni (to Esth. ii. 5) traces the complete genealogy of Mordecai back to Benjamin through Shimei (identifying this Shimei with Shimei, son of Gera; comp. II Sam. xvi. 5-6, 13; I Kings ii. 8, 36-46), Jonathan, and Saul. Still the discrepancy in Esth. ii. 5, which makes Mordecai a descendant of both Judah and Benjamin, puzzled the Rabbis considerably, and various explanations of it are given, among others the following: (1) Mordecai, was on his father's side a descendant of Benjamin, and on his mother's a descendant of Judah. (2) He was a Benjamite; but his birth was caused through David, who was of Judah; for had David followed the advice of Abishai and killed Shimei (comp. II Sam. xvi. 7), Mordecai would never have come into existence. (3) Mordecai was the only Jew who did not come to the feast prepared by Ahasuerus; moreover, he endeavored to restrain the other Jews from coming to it. (4) The word must be read , meaning "one who declares God to be one" (Meg. 12b; Esther R. ii. 5; Midr. Megillah, in Jellinek, "B. H." i. 22). Another theory makes Mordecai and Haman cupbearers at the feast (Meg. 12a). According to Targum Sheni (to Esth. ii. 6), Mordecai, after having been carried away by Nebuchadnezzar, returned to Jerusalem, and was again deported by Nebuchadnezzar in the second captivity (comp. II Kings xxiv. 14 et seq. ; xxv. 11, 21). Mordecai was a member of the Great Sanhedrin which sat in the chamber of square hewn stones ("lishkat ha-gazit"), and each member of which knew all the seventy languages. In this capacity he resolved difficult problems concerning ritual observances, on account of which he was called by the Rabbis "Pethahiah" (Sheḳ. v. 2; Men. 64b-65a). It was owing to his knowledge of languages that Mordecai was able to discover the plot of the two eunuchs (see Biblical Data above), who conversed in the language of Tarshish, their native country, thinking that no one would understand it (Meg. 13b; comp. Targum Sheni to Esth. ii. 22). Later, when, unlike the Persian courtiers, Mordecai omitted to bow before Haman, the latter, not wishing to appear disconcerted, feigned to have received his salutation. He consequently turned round and, advancing toward Mordecai, said: "And peace be upon thee," as though in reply to Mordecai's greeting. Mordecai thereupon said to him, "There is no peace, saith the Lord, unto the wicked" (Isa. xlviii. 22), which answer particularly aroused Haman's anger (Midr. Abba Gorion, ed. Buber, iii., Wilna, 1886). The courtiers asked Mordecai why he refused to bow before Haman, when Jacob, Mordecai's ancestor, had bowed before Esau, Haman's ancestor (Gen. xxxiii. 3). Mordecai replied that this took place before Benjamin, from whom he (Mordecai) was descended, was born (Targum Sheni to Esth. iii. 3). After the fatal decree had been signed and copies had been prepared for transmission to all the provinces of the Persian empire (comp. Esth. iii. 12-15), Haman left the palace in a joyous mood, and then met Mordecai. Just then the latter saw three children coming from school, whom he asked to tell him what passages they had read with their master. The children recited three different Biblical verses, each containing a prophecy that all machinations against the Hebrews would come to naught. Mordecai began to laugh, and, when Haman inquired the cause of his laughter, he answered that the children brought him good tidings (Midr. Abba Gorion l.c. ; Esth. R. iii.). Mordecai was definitely informed of the king's decree by Elijah, or, according to other opinions, by Moses or by the Holy Spirit, in order that he might pray to God for the deliverance of Israel (Esth. R. l.c. ; Targum to Esth. iv. 1; Targum Sheni iv., where Mordecai's prayer and exhortation to repentance are given at great length). Mordecai then dreamed his prophetic dream (see Esther, Apocryphal Book of), which he told to Hathach (Esther R. iv. 7). When Mordecai saw Haman approaching him with the royal horse and garments, he thought that he was coming to kill him. He therefore told the pupils who surrounded him to depart and leave him alone to his fate; but they refused to do so, whereupon Mordecai, having wrapped himself in his ṭallit, began to pray. Meanwhile Haman came up and sat down with the pupils to await the termination of the prayer. Haman asked Mordecai's pupils what was the subject of their study, and they told him it was the laws of "ḳemiẓah," that is, the handful of meal which the priest takes from a meal-offering to burn on the altar. According to another statement, the pupils were studying the laws of the omer; and when Haman asked them whether it was a measure of gold or of silver they told him it was a measure of barley. Haman said: "Your handful of meal or your little measure of barley overcame my ten thousand talents of silver" (comp. Esth. iii. 9). Mordecai at first could not believe that Haman was in earnest when he informed him of the honor which he was about to do him. But when Haman convinced him of his seriousness, Mordecai told him that it would not become him (Mordecai), who had been till then humbled in the dust, to put on royal garments. Haman then washed Mordecai, shaved his hair, anointed him with perfumes, and presented to him the meal which Esther had sent. Mordecai, owing to his three days' fast, was not strong enough to mount the horse, and Haman had to offer his back to Mordecai as a stepping-stone. While Mordecai was being conducted through the streets of Shushan, 27,000 youths, sent for the purpose from the royalpalace, each holding in one hand a golden jar and in the other a golden cup, marched before him; and the Jews on seeing them joined the procession. Mordecai, however, did not become elated by his great honor, but returned to his home and resumed his sackcloth and fasting (Meg. 16a; Esth. R. vi. ; Midr. Abba Gorion vi. ; Targum Sheni vi.). According to Targum Sheni (vii. 8), it was Mordecai whom the king appointed to superintend the execution of Haman; and Mordecai took Haman from the king's gate to lead him to the gallows. Haman implored Mordecai not to kill him, or at least not to hang him like an ordinary criminal, and begged to have his head cut off with a sword; but Mordecai remained inflexible. According to R. Jose the Galilean, the psalms which are styled "Hallel" were composed and sung by Mordecai and Esther after the Jews had been delivered from Haman (Pes. 117a). The Rabbis conclude from Esth. x. 3 that after Mordecai became viceroy some of the Sanhedrin abandoned him (Meg. 16b).